I think it’s pretty safe to assume the rules don’t apply to Jhumpa Lahiri. For starters, she won the Pulitzer Prize for fiction as a first-time author (Interpreter of Maladies). Now she just published a new collection of short stories (Unaccustomed Earth) that hit No. 1 on the New York Times bestseller list in the first week. Short stories don’t hit number one. They just don’t. Maybe she’s a good writer — ya think? I know I loved “Interpreter” and will definitely check out the new book very soon. Though I don’t expect she’ll have to come down to “Earth” anytime soon. She can pretty much do what she wants to, apparently. Check out Lahiri’s books at River City Books or, of course, you can go online. Now that spring has sprung many of us want to be out walking — downtown, through the Arb, in a city park, or around our neighborhoods. If you’re like me you enjoy listening to something during some of these strolls — a catchy tune, something that lifts the spirits. And I don’t mean a good polka. So I thought it was worth reminding you that your neighborhood bookstore is more than a bookstore. River City Books sells music, too. 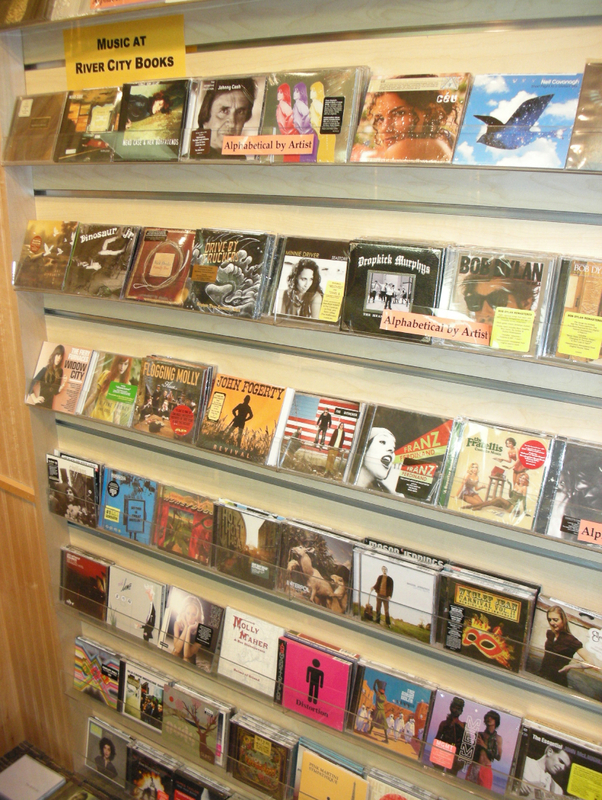 In fact, there’s a great selection of CDs. The selection of the sort you won’t find anywhere else. Check it out — maybe on your next walk about town. And if they don’t have the title you’re after ask a bookseller. Just might be orderable. Leif Enger’s Peace Like a River is the answer to one my favorite local bookish trivia questions: Which was the first title selected for Northfield Reads! communitywide book club? That book was and continues to sell extremely well at the old neighborhood bookstore. “Peace” also put Enger on the map as a national bestselling novelist. So we all knew his follow-up would be highly anticipated and — this just in — So Brave, Young and Handsome has arrived! And just in time for the big event at Carleton College on May 1. If you pick up your copy today you’ll have time to dig in before Enger’s upcoming local appearance — which, no doubt, will be as special as that first Northfield Reads! event. Plus, it’s on sale for 15 percent off through May 1! I have been remiss to mention that the old neighborhood bookstore has added to its inventory, and I am not talking about the latest-greatest books (of course they have those). RCB now has a new selection of college clothing. T-shirts, sweatshirts, fleeces. Yellow, blue, pink. Carleton, St. Olaf, of course. If you haven’t already done so, I recommend stopping by and checking these items out during your next spring stroll down Division Street. Ah … finally feels like spring. And, if I do say so myself, just in time for baseball season. Good thing, too, because Steve Johnson, author of Chicago Cubs Yesterday & Today, will appear at River City Books at 7 p.m., Tuesday, April 22, for a discussion and book signing. “Chicago Cubs” is an exploration of the life and times of one of the most recognizable franchises in professional sports. Pairing historical black-and-white images with photographs of the modern game, the book celebrates more than a century of ups and (mostly) downs in the history of a team known for its diehard fans. Of course, as always, the event is free and the public is invited to attend. I hope to see you there! Today, Monday, is the final day to celebrate River City Books’ sixth birthday by saving on nearly every item in the store. 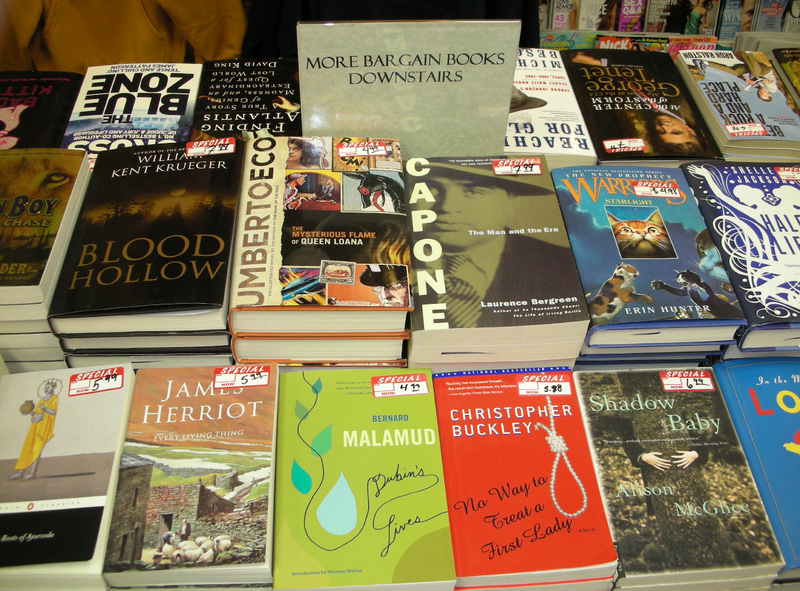 All day take 30 percent off all bargain books (some of them are pictured); 25 percent off all clothing; 20 percent off every book in the store;15 percent off all CDs and DVDs. Plus, if you spend more than $100 you’ll receive a $10 gift card good during your next visit. From 10 a.m. to 8 p.m. Today. Then it’s over. Don’t miss out! Smelled A Good Book Lately?